A leading Organisation Development practitioner has spoken with business leaders about preparing their staff for change at an event at Wrexham Glyndwr University. 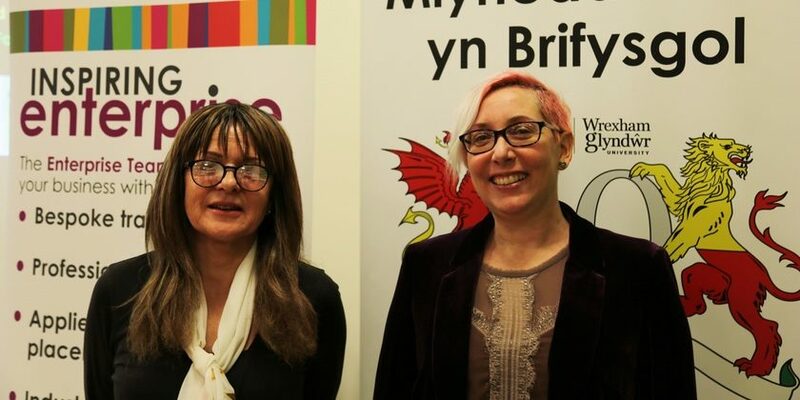 Carrie Foster, an author who has published more than forty books and worked with businesses across the UK to help them develop, was the latest speaker at Wrexham Glyndwr University’s series of events with the Chartered Management Institute. Presenting alongside the university’s Dr Jan Green, Carrie discussed how preparing staff for organisational change – and being transparent about changes as they happen – can benefit businesses. She said: “Throughout the presentation, we wanted to focus on change readiness- and how fear drives our experiences of change. “We, as managers, have a responsibility to support people – and one way we can do that is to understand the ‘why’ of change. If you understand that, it helps you face your fears, as when you know where you are going, you can work on your responses to change. During her presentation, Carrie – who is based in Wrexham – drew on her own experiences and emotional responses to the fear of change – and how she came to realise the importance of trusting in her own skills as she faced changes in business and in life. “I realised a few years ago one of my own fears was not being good enough – so realising that I am actually really good at what I do means I am not fearful of change myself,” she continued. “For instance, I’ve recently been invited to speak to JP Morgan about what I do – there’ll be a Major, and OBE – and me, and I’m self-employed and don’t even have a job title as such! Dr Green – Reader in Teaching Learning and Student Success at Wrexham Glyndwr University and Board Member of CMI Wales – added: “Whenever I hear Carrie speak, she provides real insight into the way businesses can develop and improve their systems to get the utmost from their staff. Find out more about Carrie here and more about Wrexham Glyndwr University here.